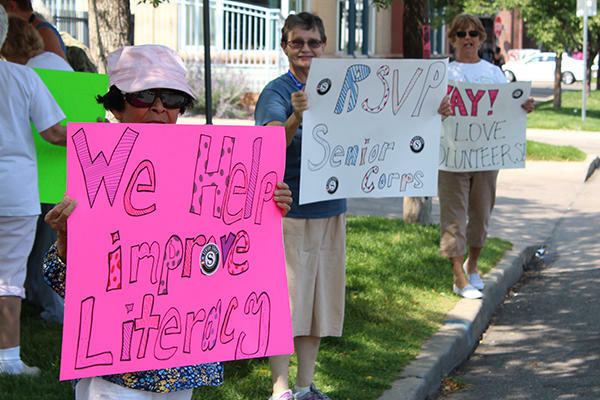 Denver — Senior Corps volunteers, ages 55 and better, devote thousands of hours every year to helping children meet literacy goals. On Friday, just before Labor Day weekend, those volunteers took to the streets near Larimer and 27th to promote the cause they hold dearly. More than a dozen volunteers from the Foster Grandparents Program and the Retired Senior Volunteer Program (RSVP), through Volunteers of America Colorado, joined forces for a “Flash Freeze” to spread the word about how the programs impact youth throughout the area. The group of seniors waving handwritten signs quickly attracted the attention of drivers and bikers passing through the area. The event was inspired by the Corporation for National and Community Service’s focus on educational success during the back-to-school season. These programs place seniors in volunteer positions that fit their interest, including tutoring school-age children. The Foster Grandparent Program exclusively places volunteers in educational settings where they are eligible to earn a small stipend. “The value of participating cannot be underestimated in the effort to help the 60 percent of children not reading at grade level,” said Patti Krattenmaker, program manager for Foster Grandparents. To make a world of difference to a child, get involved by contacting the Foster Grandparent Program or RSVP directly at 303-297-0408 or visit www.voacolorado.org.